Computer models have been suggest that we'll catch our first bout of arctic air in about a week, as lows may dip to near freezing in Houston for the morning of November 14th. This would mean a frosty next Wednesday morning. 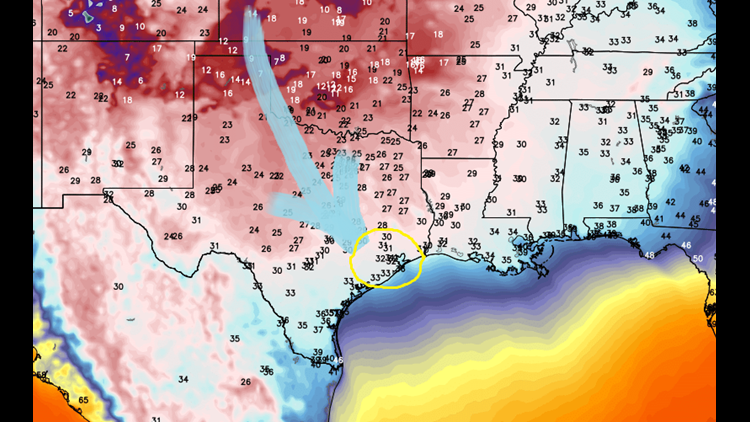 Brooks's Blog: Houston 1st Freeze In Sight! While Houston does tend to hang onto summer longer than other cities due to our lower latitude and subtropical climate, we are far enough north and oriented in a way on this continent to occasionally catch arctic air. This leads to snaps between seasons in what is an annual (and jarring) battle of the air masses. HOUSTON — I see Houston's first freeze ahead! Well, it is not guaranteed because it's 7 days away and forecasts can change in that wide of a time frame but as of now models do suggest a dip to 32° on the morning of November 14th. That's next Wednesday. What's the earliest freeze in Houston history? Oct. 20, 1989! So we're certainly in range. If an El Nino pattern does set up as it has been forecast, we'd likely see more frequent storm systems riding an unusually active southern jet stream all winter. This higher chance for precipitation combined with these occasional bouts of arctic air could lead to more snow this winter.